The Wireless Connectivity Test Set MT8862A (WLAN Tester) is for measuring the RF TRx characteristics of WLAN IEEE802.11a/b/g/n/ac (2.4 GHz and 5 GHz bands) devices. 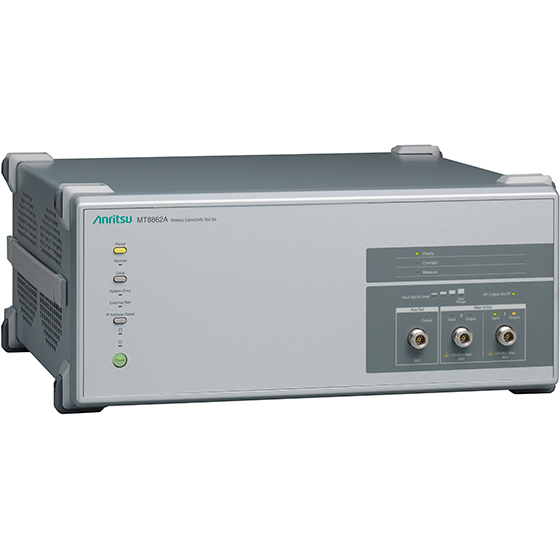 The MT8862A has standard WLAN protocol messages (WLAN Signalling) to connect with the device under test (DUT) for measuring each TRx performance item as Network Mode. By using the MT8862A Network Mode, RF TRx characteristics, such as Tx power, modulation accuracy (EVM), etc., can be measured with the WLAN devices in realistic operation conditions. No necessary to put the DUT into a dedicated test mode with directly controlling the DUT, the DUT RF performance can be quantified under the firmware conditions at actual shipment. 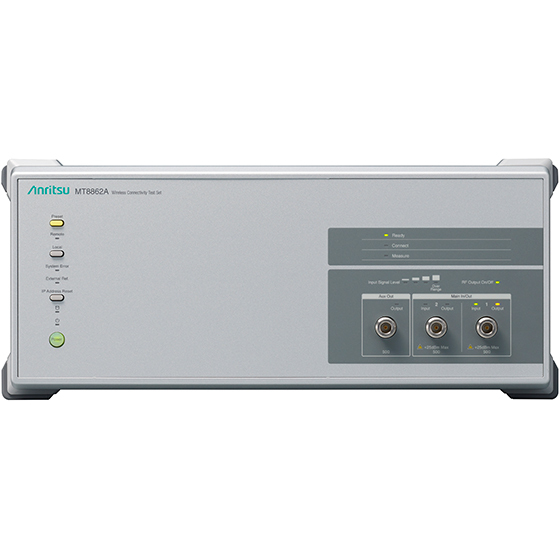 The MT8862A can simulate access points (AP) and stations (STA) to establish the DUT network connection using IEEE802.11a/b/g/n/ac WLAN protocol messaging. When the connection is established, RF measurements can be made using general WLAN communications procedures without requiring special tools and control procedures, eliminating the need for configuring a special measurement environment. The WEP, WPA-Personal, and WPA2-Personal WLAN encoding technologies are supported to enable connection and measurement without disabling DUT security settings. 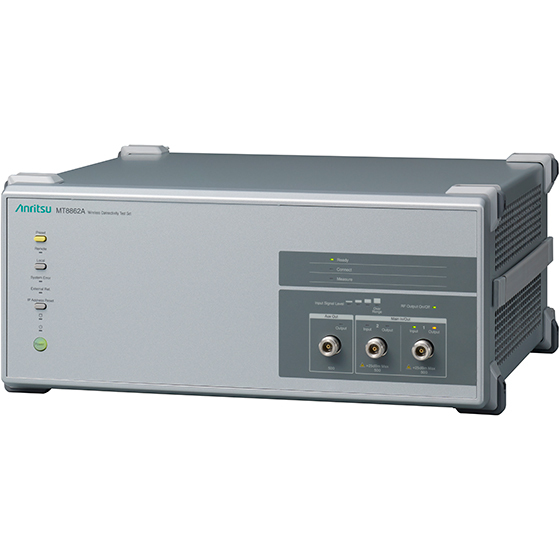 The MT8862A has a unique built-in algorithm for controlling the data rate to perform Tx measurements in the Network Mode at the user-specified data rate. The MT8862A supports Rx sensitivity measurements using the ACK frame count; counting the ACK frames sent by the DUT versus the test packets sent from the MT8862A supports calculation of the packet error rate (PER). Packets can be sent while lowering the power level by setting the power level range (-120 to 0 dBm) and step size, and the Rx sensitivity Bathtub curve can be generated automatically. Packets including MAC address and payload length can be configured in real-time for measurement at various data rates. Connect the MT8862A to the external PC using an Ethernet cable for instant access from the Web browser to complete setup of the GUI operation environment without requiring test setup operation. The Web-browser based GUI eliminates usage worries about version matching with the main frame firmware. Additionally, the MT8862A remote control port supports the DHCP client function and both host and domain name settings offer easy control simply by connecting the PC controller and MT8862A to the same network. With built-in frame capture logging function, the MT8862A can capture and save frame logs for troubleshooting DUT connection problems. Captured logs are in the *.pcap format for viewing by supported applications, making it easier to analyze DUT connection problems. 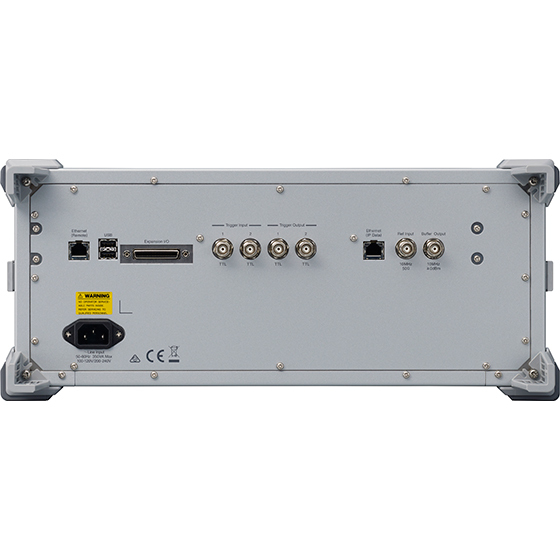 The Ethernet port on the back panel of the MT8862A can be used for exchanging IP data with an external server; IP connections between the client PC connected to the DUT and the external server connected to the MT8862A can be checked using the ping function, etc. Network Mode: Connection establishment with WLAN devices using WLAN protocol messaging (WLAN Signalling) makes measurement available. Supports secure WEP, WPA-Personal, and WPA2-Personal encrypted connections. Tx measurements (Tx power, modulation accuracy, etc.) using ICMP echo request.